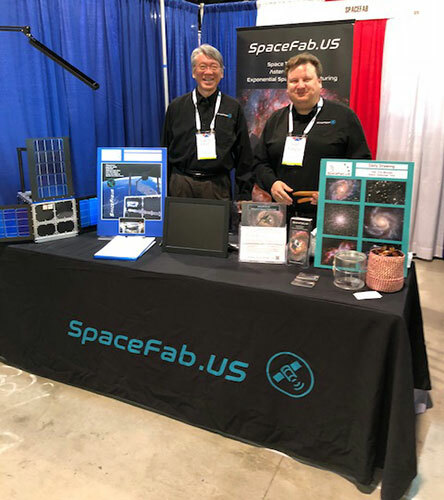 Well this is my 4th day at the winter AAS meeting and can share a few comments, this time mostly from my wandering around the exhibit hall and one special award announcement for an amateur astronomer. 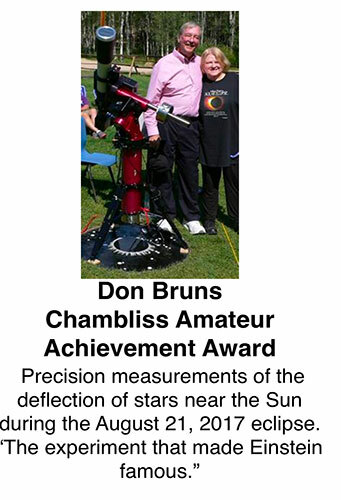 The winner of the AAS Chambliss Amateur Achievement Award this year goes to Don Bruns, who repeated some of the measurements of predicted deflection of light near the sun as measured during the total eclipse of August 17, 2017. Congratulations Don! 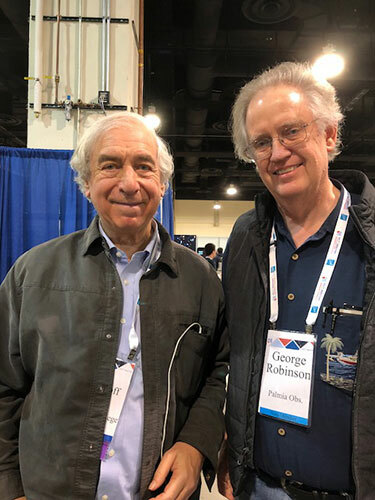 Readers of this blog will recall that our August 23, 2017 blog post described how Don told us attendees at the Astrocon 2017 Conference in Casper, WY, how he was planning to make the measurement. I also tried to capture an image of stars near the sun during the eclipse and found it was very hard to see any stars in my images due to the bright corona. We have not heard any of the details of his measurement and findings, but he went into quite a bit of detail about how with todays amateur equipment and some good analysis of potential errors and good luck that a measurement that surpassed Eddington's precision could be made. He explained the many sources of error that come about because of temperature change, position change of the telescope, and any sag or deflection between sensor plate calibration and the time of the eclipse measurement must be controlled and understand down to fractions of an arc second Pretty demanding stuff! If anyone has the results of Don's repeat of this famous experiment please let us know. There were several posters presented that covered some other amateur attempts at testing Einstein and on some unexpected affects of the August solar eclipse. 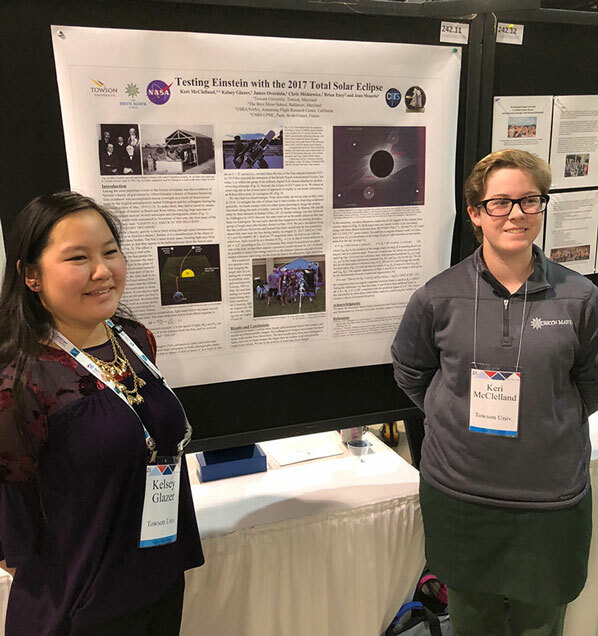 First up is this poster by Towson University and how some students set out to make the eclipse measurements, but were clouded out at the last minute. Darn, well welcome to the world of astronomy, and thanks for that Keri and Kelsey! 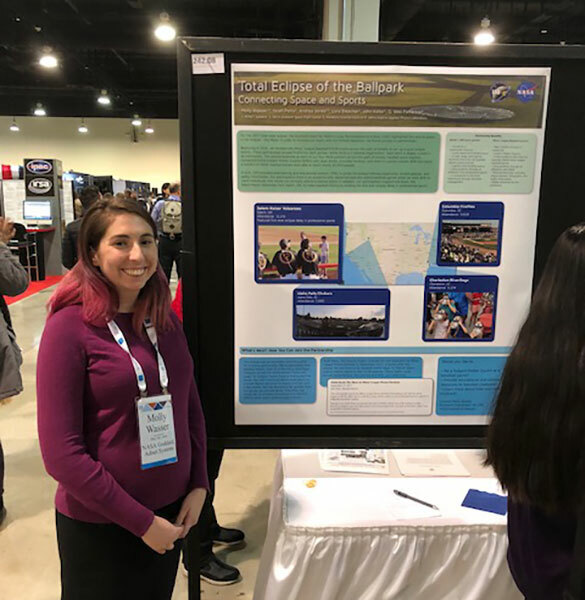 Next up was Molly Wasser, NASA Goddard Space Flight Center, and this poster detailing the effects of the eclipse as noticed at the ballpark. Hmm, that's right, the ballgame had to be have a little bit of a time out during the eclipse. Thanks for that Molly! While viewing the above two posters, I recognized another astronomer and professor, that I had to meet. It turns out that Professor Jay Pasachoff, Williams College, is the same eclipse expert that will be on our July 2019 eclipse tour in Chile. He has been to many eclipses around the world and has plans for some other eclipses before 2019 as well. Nice to see you Professor Pasachoff! There were many other posters, all very interesting, many with even titles that I could not understand, but it was fun and interesting and everyone was enthusiastic about their topic and were eager to share and discuss it. Additionally, for the first time, I saw that now even some of the posters were being presented electronically on large screen displays. 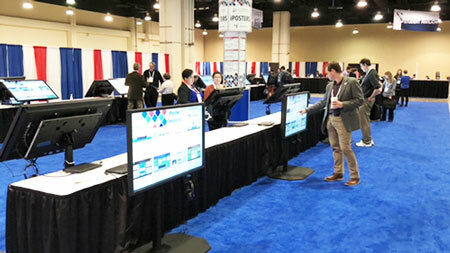 This section of the exhibit hall was reserved for, you guessed it, iPosters! Ok, that is about enough for this blog post. Tomorrow, I hope to present some more brief technical summaries of some of the sessions that I found particularly interesting. In the meantime, let me finish by showing you this business card I picked up on the exhibit floor. 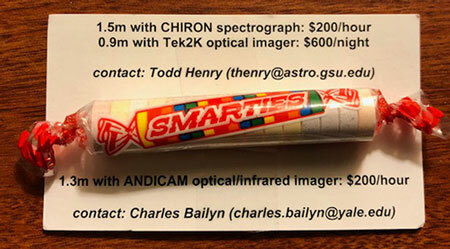 Initially, I was just drawn to the candy that was attached, but later I saw the ad for renting telescope time on a pretty good sized scope. This option is particularly interesting for me for several reasons, like, we have been clouded out or smoked out of our night of observing on the 60 inch telescope for over three times now, and the second reason is, "hey, I could easily spend that much money just getting the latest adapter or camera thingamajig to do my own observing." So if you are interested in renting time on a good sized scope check it out. Umm, the candy tasted so good so you will have to get your own candy!